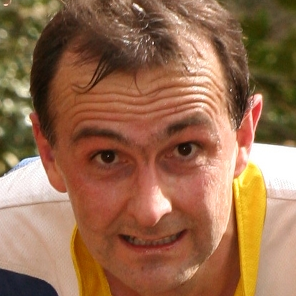 I started orienteering in 1977, swept up by the membership rush following the World Championships in Scotland in 1976. One year later, in October 1978, the front cover of The Orienteer showed “Yvette Hague, Reading OC, just after finishing first in D12 in the Swiss 5-Day event”. Twenty-one years later a new photo is needed, with a new caption: “Yvette Hague, Great Britain, just after becoming Short Distance World Champion”. This must surely be one of the most popular World Championships victories ever, but it has been a long time coming. Yvette’s World Championship debut came in 1983 in Hungary where she ran in the relay. In Australia in 1985 she finished 13th in the Classic Distance. And then we come to France 1987, and the start of my long and arduous campaign to see Great Britain win a gold medal at the World Championships. Yvette went to France as an outside medal chance having won a World Cup race there the previous year. I went to France having decided it was almost on the way home from the Dutch 3-Day. She finished 17th that year. 1989 was Sweden. I took a late decision to go and spectate. It rained a lot. The areas were uninspiring. Yvette had injury problems and only managed 18th. The Brits had gone with high hopes but things just didn’t happen. How ironic that my least memorable World Championships should have been in the country where the sport was invented. 1991 in Czechoslovakia promised to be different. Yvette had won a few more races by then (the Nordic Championships and the World Junior Championships for example) and the CompassSport preview concluded that “hopes of a medal are realistic”. The IOF had added a Short Race, so that made prospects even better. But it was not to be. Yvette was controversially disqualified for mispunching in the Short Race qualifier. She finished 25th in the Classic. I rounded off the week by leaving my passport behind in Germany. I managed to get back into Britain on the basis of a London Underground travel card and four friends wearing identical world championships t-shirts. One of the big questions in 1993 was whether the Americans could really organise a World Championships. CompassSport decided Yvette was “clearly Britain’s best hope of a medal”. Yvette finished 9th in the Short Race, but was upstaged by Steve Hale. He famously “ran the wrong side of a tree” to miss a bronze medal by one second. The organisation just about coped, and many of the British supporters ended up helping at some stage during the week. I volunteered to man a control in the Classic Race, and spent five hours sitting in pouring rain by a crag with Frank Martindale. Frank’s daughter, Julie, was running for Ireland, but it was Yvette going through our control that almost had him cheering out loud. As we left our control at the end of the race we knew that Yvette had been in third place when she passed us. We arrived at the finish area to find that the result hadn’t changed in the last few kilometres, and Yvette had a World Championships bronze medal. How do you beat that? The Men’s relay team had a pretty good go, and Steve Hale’s once-in-a-lifetime last leg got them a silver medal. America is easily my favourite World Championships. Two British medals and superb terrain: what more could you want? Well, a gold medal would be nice. By 1995 in Germany the British spectators were simply debating what colour Yvette’s medal would be rather than if she would win one. We stood and cheered and got sunburn, and it was all worthwhile as she stormed to silver in both individual races. Norway in 1997 was another hot and sunny week. Training injuries meant she could only manage 8th (Classic) and 13th (Short). The week ended with a possible hint of things to come with a kilted bagpiper making himself prominent as the women came home an excellent 5th in the relay. And so we come to Scotland 1999. Yvette warmed up by winning the World Cup Short Race in the Lake District, and the crowd went wild. Could she do it again when it really counted? Just to cause confusion, she got married and suddenly we had to learn to cheer for Yvette Baker, She finished the Classic Race with the leading time, and said she was happy with her run. But one by one the rest of the field came in, and it was finally to end up as 4th place. Perhaps the Short Race then. The Short Race qualifier went to plan, with Yvette winning her heat, leaving her to start last but one in the final. I spent the race in the forest with a Swedish TV crew. We were positioned to capture the spectator control, and then a quick dash allowed us to see runners at the penultimate control as well. The radio split times sounded encouraging and suddenly I looked up to see a crowd of runners at the spectator control. Unbelievably Yvette had caught all three runners ahead of her. The four runners set off on the final loop leaving the crowded finish field to wait in hope. I crossed over to the penultimate control and waited. We already knew that many runners were missing this control and ending up on the hill to our left. I saw a group of three people coming round the edge of the hill. This was it, but Yvette wasn’t with them. And then all I remember is a British O-suit flashing past away from the control and towards the finish, leaving the others to loop back and punch. Then the cheering started and we strained to make out what the commentators had to say. World Champion. Gold medal. Yvette, we never doubted you. But there was still the relay. This turned out to be in probably the best setting of any World Championships race I have been to, and it certainly had the best commentary. I’d swapped the Swedish TV crew for a Finnish TV crew, and got to see some of the race in the forest, as well as from high up on the hill overlooking the finish. I will never forget the noise that the crowd made as Heather Monro punched at the last control and brought the Brits into first place after two legs. Yvette was running last “Relay stalwart in anyone’s dream team” CompassSport had said in the preview. She went out in fourth place, just seconds behind the Swedes. The radio reports all around the course simply told us that it would be Sweden or Britain for bronze. And by the end it came down to a straight sprint into the finish field. The yellow and blue of Sweden just held off the red, white and blue of Great Britain. Maybe next time.